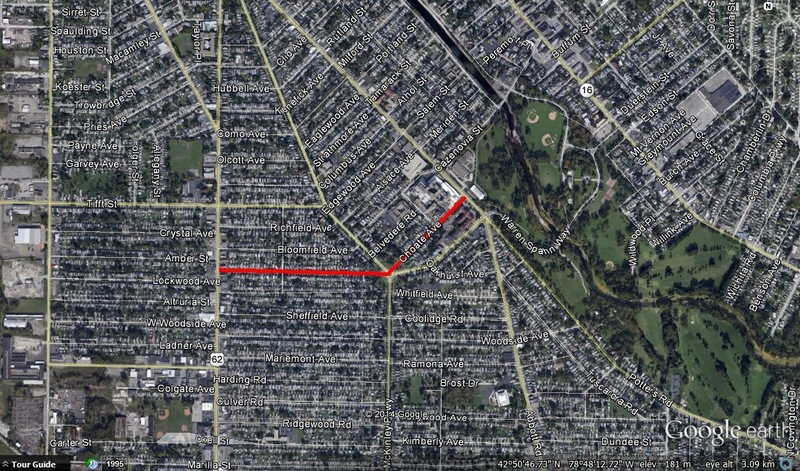 Choate Avenue is located in South Buffalo, running between South Park Avenue and Abbott Road. The street cuts through land once owned by Rufus Choate, a man who helped build South Buffalo. Rufus Mortimer Choate is a descendant of the Choate Brothers who were among America’s pioneer settlers from England who settled in Massachusetts in 1643. A more famous Rufus Choate was a senator from Massachusetts. Mr. Choate was born in Clarence on October 4, 1840. He attended public schools, the Classical Academy in Clarence and Bryant & Stratton’s Business College. During the Civil War, he volunteer at the first call for soldiers, enlisting in 1861, but was never called to the front. After the War, Mr. Choate began working as a clerk in the ticket office at the Buffalo Docks and for the U.S. Customs Office. He served as a local passenger agent for all four of the ship lines which used the Buffalo Harbor from 1866 until 1888. In 1888, he resigned to begin working in the real estate business. In 1866, Mr. Choate married Ellen Strickler. Millard Fillmore’s brother performed their ceremony. The Choate family lived at 1365 Abbott Road, their home was known as Windermere House. At the time, it took an entire day to travel into the city to do your shopping and then home again. Several rail crossings were located along the route. When they arrived at the railroad crossings, the horses would often rear up on their hind legs due to fear. Mr. Choate worried that his wife and children would be injured if the horse would lose control. He worked to eliminate those at grade crossings. Windermere House was one of the first houses in South Buffalo to be lit by natural gas. It was an English villa style home, and was surrounded by a high brick wall with iron fence and gates. The home had nine bedrooms, a billiard room and spacious rooms for entertaining. The grounds consisted of orchards, gardens, lawns and a tennis court. Windermere House became the first Mercy Hospital. The Sisters of Mercy who were brought in 1858 by Bishop Timon to assist with schooling at St. Brigid’s. The Sisters soon realized that a hospital was needed. The original hospital was a 30-bed facility opened in the house in 1904. 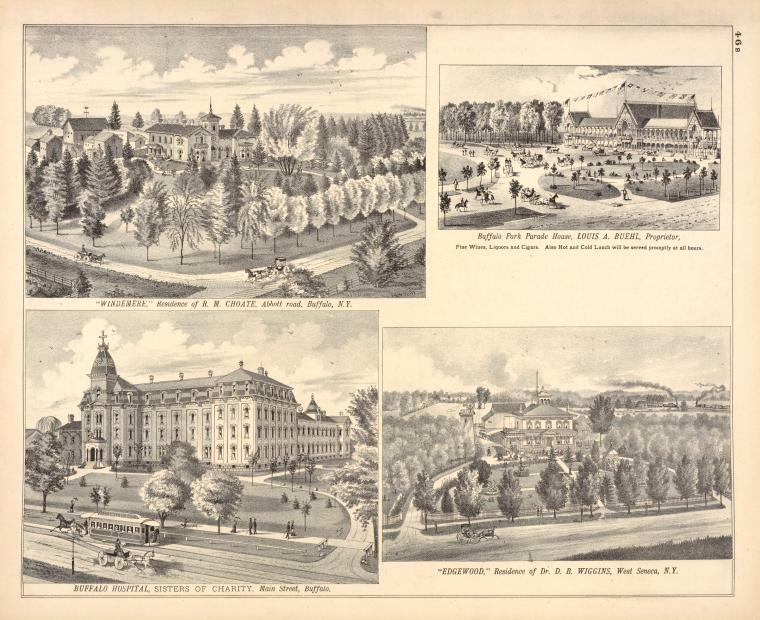 The hospital is still located at the corner of Choate Avenue and Abbott Road and has grown to be one of the largest in Western New York. The sisters also started Mount Mercy Academy, a high school for girls and Sancta Maria College (now called Trocaire, which means Mercy in Gaelic). Mr. Choate owned a great deal of real estate. He sold off properties, developed houses along and named the streets of Richfield, Bloomfield, Whitfield, and Sheffield, as well as Choate Ave. He served as secretary of the Woodside Land Company, which developed other real estate in South Buffalo as well. When the Windermere House was taken over by the hospital, the Choate Family moved to 193 Cleveland Avenue and then 61 Brantford Place in what is now the Elmwood Village. The houses are still standing. Mr. and Mrs. Choate had six children. Sadly, at age 18, their oldest son, Rufus Jr., who went by “Rufie”, disappeared following an argument with his father. His body was found 4 months later in the hayloft of his father’s barn, after an apparent suicide. Rufus Choate is said to have done more than any other man toward building up South Buffalo. He was instrumental in creating Cazenovia Park, as well as South Side and Red Jacket Parkways. He contributed 12 acres of his own land for the parks system. He was organizer and president of the South Buffalo Business Men’s Association. Through the Association, he abolished the old toll gate at Seneca Street and Cazenovia Creek and the 16 hazardous grade railroad crossings of South Buffalo. Mr. Choate died in 1916 and is buried in Forest Lawn Cemetery. Choate Avenue was requested by a friend. If you’d like to request a street, email buffalostreets (@) gmail.com and if information is available, it might get moved up in the queue. Be sure to check out the street index to learn about other streets. “Choate Avenue Honors Donor of Park Areas”. Courier Express. September 17, 1939. Our County and Its People: A Descriptive Work on Erie County, New York. Edited by Truman White. Boston History Company: 1898. Memorial and Family History of Erie County, New York. The Genealogical Publishing Company. Buffalo, New York: 1906. 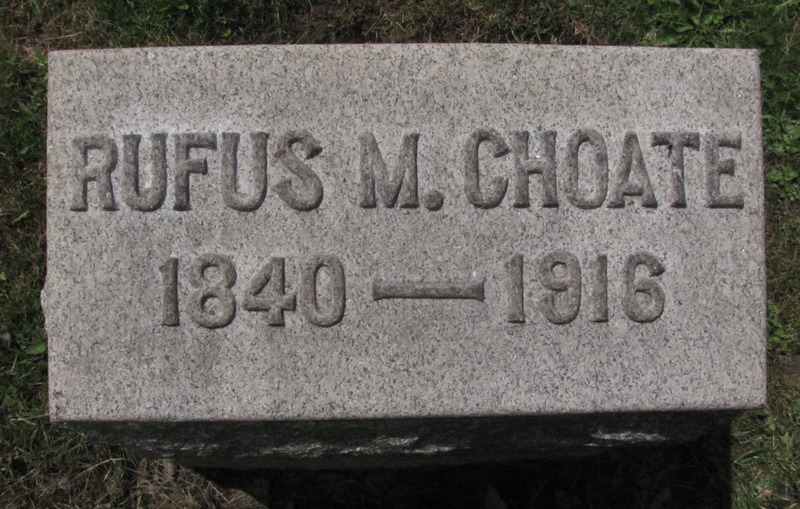 “Rufus Choate’s Body Found at Last”. New York Times. May 6, 1895. Your knowledge of the Buffalo area, along with your style of writing, is MORE than entertaining and informative!